While their anthem song may be “On the Road Again,” their heart song is probably “Imagine” by John Lennon or “What aWonderful World” by Louis Armstrong. As they travel the backroads, highways and creek beds that make up the Comal Independent School District, they offer a unique perspective on education, students and families. While their anthem song may be “On the Road Again,” their heart song is probably “Imagine” by John Lennon or “What aWonderful World” by Louis Armstrong. As they travel the backroads, highways and creek beds that make up the Comal Independent School District, they offer a unique perspective on education, students and families. They are the small team of homebound teachers who ensure that every child in the district receives an education. Homebound teachers serve students from the age of three to the age of 21 who are either general education or special education students. Special education students are identified for special education services based on federal and state eligibility requirements. Their medical needs may require them to stay home. General education students who are on homebound status, must stay home due to an illness or other medical reason for a certain amount of time, explains Carolina Ferrell, special education coordinator for elementary-aged students at Comal ISD. Currently, Comal ISD employs four homebound teachers to serve its 589 square miles, five counties and more than 23,000 students. While each teacher’s caseload varies between two and eight students, the total number of students on homebound status is generally around 20 to 25 with up to 75 during the flu season. With specific areas of focus, these four teachers are certified in their fields as well as general and special education. Sylvia Al-Manakhi, who has been a homebound teacher for eight years and has 15 years of teaching experience, teaches essential academics to students from the third grade to Life Bridges, which is the 18-21 age group. “These are my students,” says Al-Manakhi. “Most of them will not attend a school setting at all because they are medically fragile. This marks Jenevieve Hazel’s first year as a homebound teacher and her second year as a teacher. She works with students from the Preschool Program for Children with Disabilities (PPCD) through the third grade, and currently she has five homebound students. Palmer is in her second year as a homebound teacher and teaches elementary to high school general education depending on the need. She also works with students who are pregnant and receive six weeks of homebound service which includes general education coursework as well as life skills. Her caseload varies throughout the year since her students can return to the classroom setting once their medical conditions are cleared by a physician. Known as the ‘math guy,’ because of his ability to teach algebra and geometry, homebound teacher Dwight Schneider has been on the road for Comal ISD for 18 years. His focus is mainly with middle and high school homebound students. He has four students this year. In order for a student to be homebound, Ferrell explains, a physician must complete a homebound needs assessment form which identifies the student’s medical condition, confinement period, contagion and potential risk for them attending school. This form is reviewed by the student’s Admission, Review and Dismissal (ARD) or 504 committee which makes the final decision. The physician typically contacts the school concerning a student who needs to be homebound or placed away from the school setting for four or more weeks, which is the rule for homebound status. Besides the primary teaching roles, the homebound teachers also serve on the students’ ARD or 504 committees, Ferrell explains. The ARD committee determines whether or not a student in eligible for special education and develop the Individual Education Program (IEP) for eligible students. For the medically fragile, students who will never be able to enter a school building or setting, these homebound teachers are often their one connection to a world they see only on television or read about in books. Many of them are bedridden and their homes mimic hospitals with hospital beds and medical equipment. With additional efforts to provide homebound students with school spirit and camaraderie, the homebound teachers presented each homebound student with a welcome back to school basket on the first day of school this year. Filling the baskets for each of their kids, was easy, says Palmer, who explained that each homebound teacher knows their students’ personalities, needs and hobbies. “We really tried to incorporate their personal interests, because a lot of these kids we see on a day-to-day basis,” Palmer continues. “We know them the most. A couple of my elementary kids are really into drawing, artwork and that kind of stuff, so we made sure they had sketch pads, canvasses, fancy pens and pencils. We also added sensory items which were personalized as well. While most teachers have some autonomy when it comes to teaching inside a classroom, homebound teachers are experts at coordination and flexibility. These are their super powers, so to speak. They must coordinate with the individual classroom teachers in order to receive the student’s lessons; with either the ARD or 504 committee in order to carry out the student’s IEP; parents and care-givers to schedule visits; home-health providers and medical appointments to plan around treatments; and the student. They may need to coordinate home visits according to a student’s allergy, for example. If a student who is allergic to pets is scheduled after they have seen a student with a pet, they could be placing that student in danger. They must sanitize their hands and their materials including iPads and books, prior to entering a home. Besides pets, homebound teachers have watched out for candles, perfumes and soaps as allergens, as well. Communication is equally important, especially when considering the district’s size with 31 schools. A homebound teacher could have up to 15 teachers at one time sending student assignments in various subjects. The campus teacher remains the teacher of record when a student becomes homebound. The homebound teacher essentially facilitates the lessons which are provided by the teacher in the classroom. Even when they average 2,000 miles a month, get caught in snow or ice storms, fill up their gas tanks every other day and hit a deer or two, these teachers wouldn’t want it any other way. Homebound teachers also get attached to the families of homebound students. Most of these families are going through a difficult and sensitive time, and these teachers are a link between home, school and family. The life lessons these four teachers are teaching their students are ones for the entire community to embrace – compassion, hope and generosity. 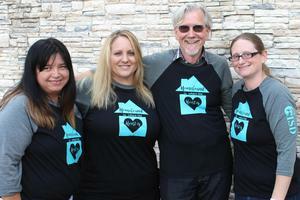 In photo (L-R): Comal ISD Homebound Teachers Sylvia Al-Manakhi, Jenevieve Hazel, Dwight Schneider and Julianna Palmer.